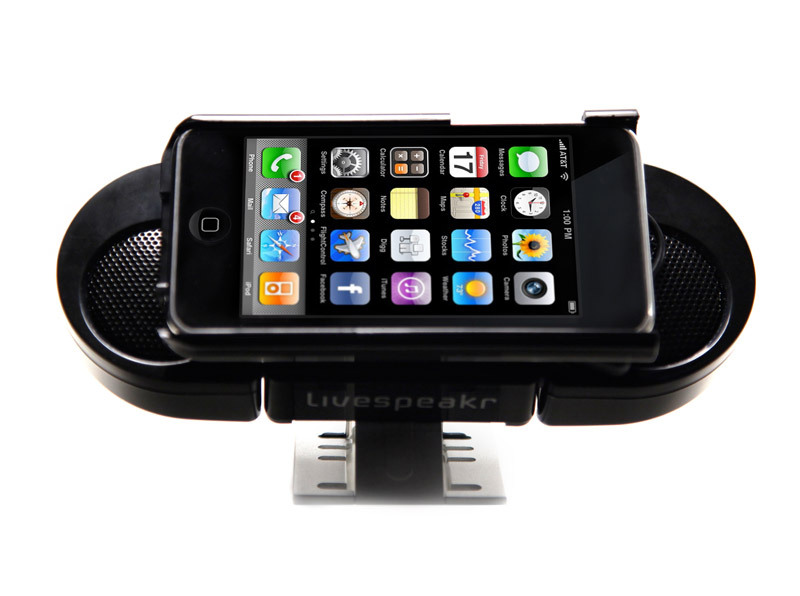 Livespeakr is the ultra-portable, multi-functional speaker system that is specifically designed for the Apple iPhone, iPod touch, iPod classic, Google Nexus One, Motorola DROID, Palm Pre and Palm Pre Plus. 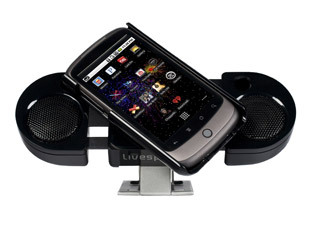 The “Super” cradle rotates to work with your media player in both portrait and landscape mode. Livespeakr is small enough to fit in your pocket, loud enough to rock a party (if you want it to), and the internal rechargeable battery lasts up to 16 hours on a single charge. Get ready to enjoy your multimedia content like never before! What separates Livespeakr from the competition is its convenient functionality and highly innovative features. 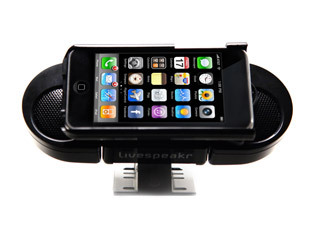 Livespeakr is, “ultra-portable”. This means Livespeakr can fit in your backpack, purse, or pocket and thanks to the internal rechargeable battery; you never have to worry about wires or replacing batteries. 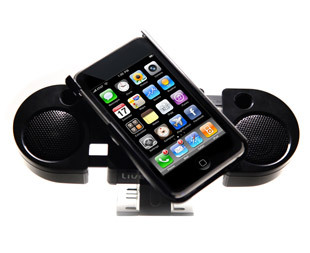 The specially designed, “Super Cradle”, fits and protects ALL generations of the Apple iPhone, iPod touch, iPod classic, Google Nexus One, Palm Pre, and Motorola Droid. The cradle locks into place on the Livespeakr and rotates (functioning much like the handling of a Rubik’s cube) to work with your media player in both portrait and landscape mode. Livespeakrs premium speakers are also shielded from annoying R/F interference that can cause static and popping noises in many unshielded speakers. Simply turn Livespeakr on prepare to experience all of your favorite music, videos, and apps like never before! Click Here to View our Product Comparison Video. Click 1: Simply slide your media player into the Livespeakr, “Super Cradle”. The speakers are stored, hidden behind the unit for maximum portability. Click 2: Give the, “Super Cradle”, a gentle rotation. Your media player now rotates 90 degrees to rest in the vertical or, “portrait”, position. Click 3: Another twist will turn the unit another 90 degrees; the speakers will expand and the unit will click into place. Livespeakr is now in landscape mode for viewing all your multimedia files. 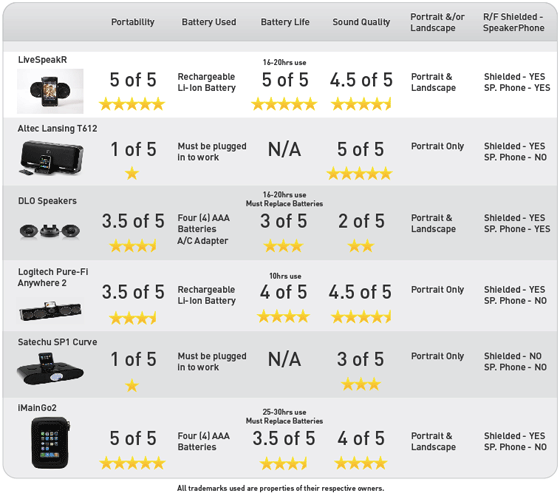 Livespeakr provides a much needed sound boost to all generations of iPhone, iPod Touch, iPod Classic, Google Nexus One, Motorola DROID, Palm Pre, and Palm Pre Plus. Premium custom speakers prove that amazing sound can come in a small package. 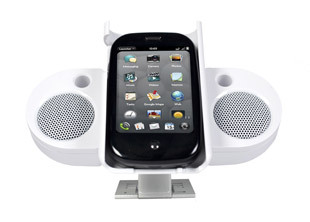 Speakers expand, contract, and rotate to work with media players in both portrait and landscape orientations. 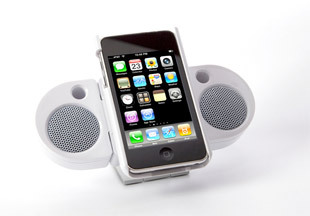 Powered by a rechargeable Lithium-Ion battery that lasts up to 16 hours; AC/USB charger included. 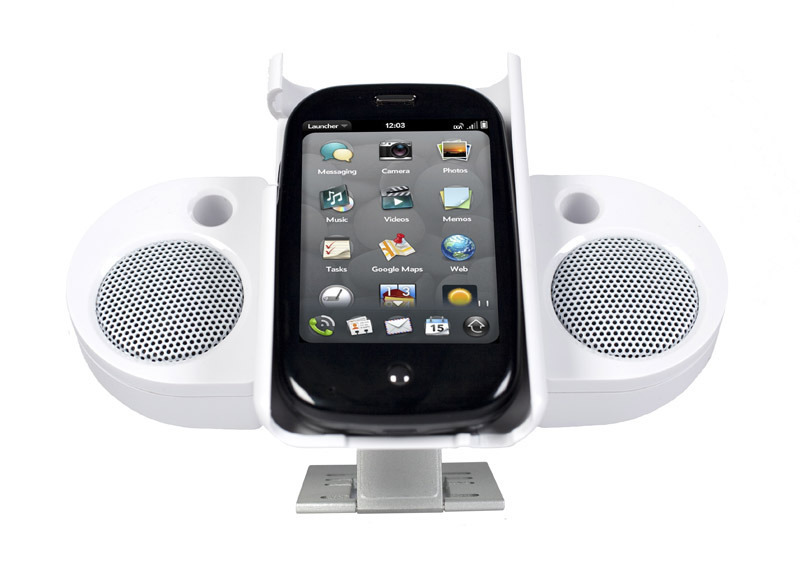 Sleek retractable aluminum stand on the back provides multiple viewing angles. Rubberized feet prevent the unit from sliding and keep it stable. Low-profile design allows Livespeakr to be taken anywhere–it can even fit in your pocket! RF/GSM Shielding lets you enjoy your Livespeakr without interference from electronic devices.